Is it pasta? Is it chili? Yes to both. 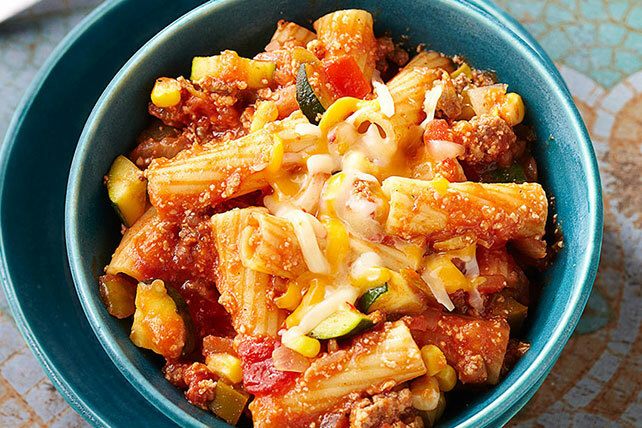 Cooked in a skillet, this dish looks like pasta but tastes like classic chili with ground beef, veggies and cheese. Meanwhile, brown meat with onions and garlic in large skillet. Add zucchini, corn and chili powder; cook 7 min. or until vegetables are tender, stirring occasionally. Stir in tomatoes and salsa; cook 3 min. or until heated through, stirring occasionally. Drain pasta. Add to meat mixture; mix lightly. Stir in 1/2 cup cheese. Serve topped with remaining cheese. You will need about 1 large ear of corn to get the 1 cup kernels needed to prepare this recipe.